Prevalence of insomnia has recorded a tremendous surge in the recent past, however development of an effective treatment procedure for insomnia has not yet been realized. In order to improve insomnia therapeutics, there has been an increasing emphasis on developing novel sleep-inducing medical devices along with new technologies. Medical device manufacturers are therefore increasingly concentrating on developing smart & efficient wearable sleep-inducers with the help of advanced technologies to offer effective breathing exercises, which in turn enable patients in sleep initiation. Such devices work in conjunction with smartphone applications and are designed specifically to enable patients in falling asleep relatively faster, and staying in their sleep for sufficient amount of time. Increasing efficiency of drugs, which is mainly attributed to growing bioavailability of these drugs, are likely to enhance insomnia therapeutics in the upcoming years. Development of new drug formulations for improving effectiveness of drugs is anticipated to remain a key strategy among pharmaceutical industries. Although there are several drugs available in the market for treatment of insomnia, prolonged use of majority of these drugs has been associated with dependency and addiction. This has further necessitated the requirement of treatment under medical supervision. Growing geriatric population is expected to remain a key factor driving demand for insomnia treatment. In addition, mounting incidences of mental disorders along with rising stress levels among the urban population has further created demand for insomnia therapeutics. Insomnia prevails as the most common sleep disorder, affecting nearly 35% of the population worldwide. Cases of insomnia are categorized based on etiology into primary and comorbid subtypes. The global insomnia market is highly fragmented, along with entry barriers for new players in terms of product efficacy, innovation, and cost. However, insomnia therapeutics center on commonly available low-dose sedating antidepressants and Nonbenzodiazepines, despite introduction of several novel agents, mainly because of low awareness among patients. The global market for insomnia will register an impressive growth during the period 2017 to 2026, according to Transparency Market Research’s (TMR) new report. Revenues from the market will reach roughly US$ 4,000 Mn by 2026-end. North America accounts for the highest percentage of insomnia-affected patients. For example, according to the Centers for Disease Control and Prevention (CDC), approximately 70 Mn adults suffered from insomnia in the United States in 2016, with the male population affected being relatively higher. Increasing healthcare spending, and surging prevalence of sleep disorders will create avenues for insomnia therapeutics in the region. North America is expected to remain the most lucrative market for insomnia, with sales exhibiting the highest CAGR through 2026. Asia-Pacific excluding Japan (APEJ) will also remain a remunerative region for growth of the insomnia market. The market expansion in APEJ can be highly attributed to increased stress level of working population along with shift-work related sleep disorders. Governments in the region are constantly focusing on improving their healthcare system along with the provision of favorable reimbursement policies, which in turn might impact the insomnia market in APEJ. Although few players in the global insomnia market offer branded drugs, cost sensitivity prevails as a major challenge in most of the countries worldwide. Drug manufacturers are therefore focusing on the development of new cost-effective chemical entities & novel molecules for boosting their sales and obtaining larger market revenue share. Key companies profiled by TMR’s report include Pernix Therapeutics Holdings, Inc., Paratek Pharmaceuticals, Inc., Sumitomo Dainippon Pharma Co., Ltd., Teva Pharmaceutical Industries Limited, Vanda Pharmaceuticals Inc., Takeda Pharmaceutical Company Limited, Pfizer Inc., Sanofi, Merck & Co Company, and Mylan N.V. According to the Sleep Health Foundation, Insomnia has been estimated to affect over one-third of the global population. Insomnia is characterized on the basis of multiple patterns such as difficulty in sleep initiation & maintenance that is usually accompanied with awakening too early & trouble sleeping again or frequent awakenings. Long-term insomnia has impacted daily life of individuals suffering from the disease, and has been associated with nervous breakdown or severe depression if left untreated. Increasing presence of patented molecules and potential clinical pipeline drug candidates hold promise in the treatment of insomnia. Demand for insomnia therapeutics will witness a tremendous rise on the back of growing geriatric population, and rising stress level among the urban population. Transparency Market Research (TMR) has published a new insightful report on the global insomnia market. The report delivers forecasts on the global insomnia market, and examines the market in detail, providing important dynamics affecting the market expansion. Along with the provision of information on latest market trends, restraining factors, and augmenting factors impacting growth of the market, analysis on the data regarding multiple market parameters has been included in the report. The report’s initiates with a chapter titled “executive summary”, which issues a summation of global insomnia market coupled with the information on imperative market numbers such as historical CAGR (2012-2016) and forecast CAGR (2017-2026). These numbers rendered are associated with the market segments incorporated in the report. Trailing the executive summary is a chapter titled “overview” that incorporates the definition of “insomnia”, which succeeds an incisive market introduction. The overview chapter clearly describes the wide scope of global insomnia market. Some chapters in the report offer information on the pricing analysis coupled with the cost structure regarding the global insomnia market. Proceeding further, the report offers forecasts on the global market for insomnia based on a segmentation analysis. Branching the global market for insomnia into five key segments viz. technology, application, price range, product type, and region, the report delivers associated market numbers in terms of the market share comparison, Y-o-Y growth comparison, and revenue comparison. 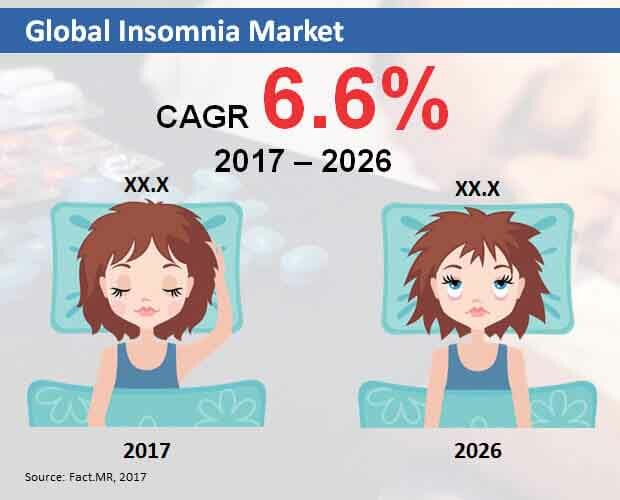 The global insomnia market has been geographically characterized by the report into Latin America, Asia-Pacific excluding Japan (APEJ), North America, Europe, Middle East & Africa (MEA), and Japan. A scrupulous analysis regarding the global insomnia market’s competition landscape has been issued in the concluding chapter of this report, incorporating information on prominent industries that significantly contribute to the market expansion. Occupancy of these market participants is tracked with the aid of an intensity map. Profiling key market participants rigorously, this chapter offers insights based on SWOT analysis, key developments, key financials, company overview, and product overview. A robust research methodology, proven & tested, has been employed by TMR’s analysts to develop the report on global insomnia market. The research methodology used has helped analysts in offering accurate insights related to the global insomnia market. It depends entirely upon the secondary and primary researches, for gaining important information associated with the market. The information compiled has then been validated by the analysts several times for ensuring the report’s authenticity, and for making it a reliable & authoritative source of reference for readers of the report.